Distributed By – Beechwood Music Distribution Ltd. 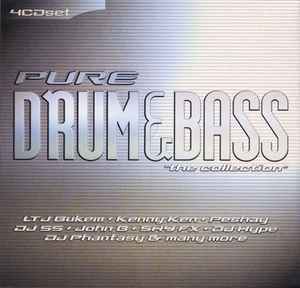 Box set release of Pure Drum & Bass and Pure Drum+Bass Volume 2. Comes in 4 jewel cases in a cardboard slipcase which is narrower than the cases. The discs themselves are identical to the original releases. There are no musical credits on this box, only licensing info. Track 1-2 is titled "The Piano Tune"
Track 1-10, on original release is listed as "P.P.S. - Ambient Pressure" on back and "PPS - Ambient Surprise" on inside. On this box it's listed as "PPS - Ambient Surprise" everywhere. Track 3-3 is titled "Kill A Bullet"
Track 3-10 has no mix name listed. It ends at 6:43 but there is a blank running up to 7:04. Track 4-9 has no mix name listed.